Jacquard InkJet cotton & silk retains the natural hand of the fabric. 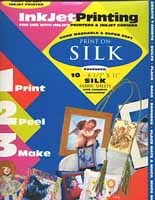 Run through your desktop inkjet printer just like paper. The results are permanet, light fast, hand washable, soft and supple. Create cushions, doll clothes, clothing labels, place mats, T-shirts, quilts, flags, bags, banner, and and anything else you can think of. 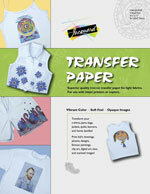 Superior quality iron-on transfer paper for light colored fabrics. 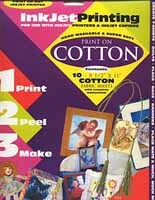 Jacquard Transfer Paper is exceptionally versatile! 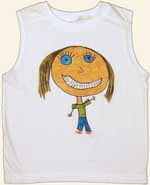 Images and designs can be can be made from kid's drawings, photos, clip art, scanned images and text. The Transfer Paper can be run through an inkjet copier or printer, or you can also draw directly onto the Transfer Paper with crayon, markers, or inks! Creating unique personalized t-shirts, bags, shorts, and banners has never been easier. The Transfer Paper is of excellent quality and has an exceptionally soft feel, it's so soft that the transferred image feels like it's part of the fabric. 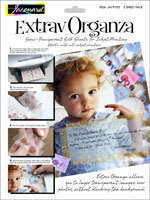 It is extremely versatile and is great for kid's projects as well as one-of-a-kind artwork.